Catamaran Flat/Top Cover: Covers both the hull and tramp top sides completely. 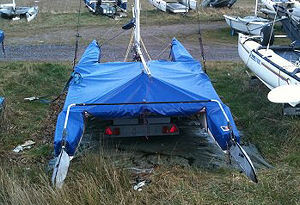 The best cover for general storage, with two halyard points. Catamaran Tramp Cover: Quick to fit.and keeps UV off the tramp, with two halyard points. Hull Covers: Made from tough coated nylon, the snug fit protects the hulls of your cat from wear and tear when towing. All our Hobie 16 Dinghy Covers are manufactured in our factory in Southampton, we do not sell imported covers. We use only the best quality materials whether PVC, Polyester/Cotton, Hydralite, Nylon or Weathermax.